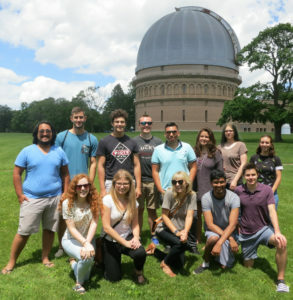 CIERA is pleased to announce the Summer Research Experience in Astronomy at Northwestern for high school students during Summer 2019. This highly-interactive, small-cohort program provides exposure to real astronomy research experiences in an atmosphere of team-style learning, hands-on training, and individual mentorship and advising. Students enrolled in the research experience program will take computer programming classes, hear astronomy lectures on various cutting-edge topics, and tackle selected readings and structured assignments. Special programming includes science communication training, field trips, and panel discussions to learn about careers in astronomy. During the second three weeks of the program, students will be assigned their own research project with an astronomer mentor. First three weeks: June 24 – July 12, 2019. Second three weeks flexible. A program instructor will accompany the students on all activities. Optional field trips to science facilities such as Fermilab or Argonne National Labs will take place twice during the program, on Saturdays. Students should bring or purchase their own lunch. Lunch will be on campus with the program cohort. Monday, Wednesday, Friday: Meet with astronomer research mentors. Tuesday & Thursday: Special topics (such as research communication training) and career exploration (such as career panels and informal discussions with professional astronomers). Weeks 3-6 will have more open schedules focused on engaging with an astronomy research project. These projects will call upon the skills and knowledge acquired in the first three weeks and be closely guided by an astronomer research mentor. Students and mentors will meet for at least two hours per day and students will be provided any necessary resources and space in CIERA to work alongside their cohort. Students will have the opportunity to present their projects at the end of the program. $2,700 for 6 weeks; $350 each additional week. Need-based financial assistance may be available. Must be a current high school student at time of application. This is a daytime program. Students must have their own reliable transportation to and from the program. Someday you will be a leader in the world scientific community, and will have to decide between funding either a crewed undersea exploration base or a crewed Moonbase — you can only fund one. Which would you fund and why? If you could travel back in time, or across the Universe, which would you choose and why? You are the leader of a Nobel-prize winning research team. You’ve been given a grant to hire either a world-renowned graphic artist or a world-renowned writer to help tell the story of your work. You can only fund one. Which do you choose and why? A recommending teacher’s name and email address. Teacher will send a letter of recommendation to an email address provided on the application. Application results to be announced as soon as possible. We reserve the right to cancel the Summer 2019 program with 12 weeks’ notice. Please email us at CIERA@northwestern.edu.